As part of its Community and Youth Engagement Outreach program, the Mayor’s Office on African Affairs (MOAA) invites you to attend its third annual Young African ConneXions Summit (YAX) in partnership with Howard University on Friday, July 14, 2017.Themed Strengthening Diaspora Partnerships, the summit will take place at the Howard University School of Business Auditorium located at 2600 6th Street, NW, from 5:00pm to 7:30pm, . 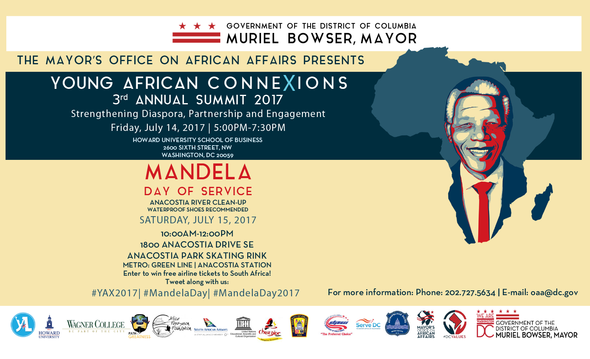 Following the annual Young African ConneXions Summit, MOAA will host its third annual Mandela Day of Service on Saturday, July 15, 2017. Please join MOAA's staff and volunteers at the Anacostia Park skating rink on 1800 Anacostia Drive SE, from 10:00am to 12:00pm, for 67 minutes of community service to commemorate the life and legacy of Nelson Mandela. RSVP here for MOAA's Third Annual Young African ConneXions Summit (YAX). RSVP here for 3rd Annual Mandela Day of Service. Click here for a recap of last year’s MOAA'S 2nd Annual Young African ConneXions Summit.